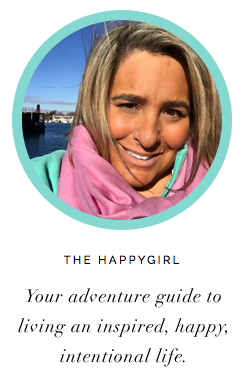 the happygirl: entertainme: review "tower heist"
There is something wonderfully fun about watching Eddie Murphy on the big screen, exactly where he is supposed to be. It's been awhile since we've seen him ("Meet Dave" 2008) or heard that signature laugh of his or seen that signature sideways glance of "You clearly did not just say that thing to me, dear sir." Face it. We love Eddie Murphy and it feels good to see him in a film where he gets to play to his strong points of comedy combined with "I'm just a misunderstood soul." 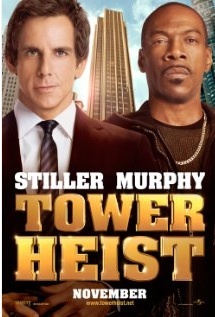 As a thief in "Tower Heist" Murphy (Slide) is perfectly cast against Ben Stiller (Josh Kovacs) as the tower manager as they partner together to recoup money stolen by the penthouse resident who Bernie Madoff-like absconded with millions in a pyramid scam. (Alan Alda is wonderful in the role of this devious miscreant tycoon Arthur Shaw.) Unfortunately for the employees at the tower, Kovacs had previously encouraged Shaw to take on the Tower employees pensions and then lost it all. Feeling responsible he assembles a rag tag team including his brother-in-law Charlie (Played by Casey Affleck), housekeeper Odessa (Gabourey Sidibe) and the brilliant Mr. Fitzhugh (Matthew Broderick as a former tower resident recently laid off and evicted) to get their money back. Watching them scheme is the fun here. Think of this as "Ocean's Eleven" meets "It's a Mad Mad Mad Mad World." It works especially the humor Broderick brings into the role as the forlorn Fitzhugh. Losing one's life savings to a maniacal thief a la Bernie Madoff is a sensitive taken directly from today's headlines and I wondered if it was too soon for a film tackling this topic humorous but I was wrong. Listening to the audience howl in the screening it was clear that it's never too soon to see a wretched tycoon get exactly what he deserves. "Tower Heist" with its humor, suspense and great casting is a fun movie for a cold autumn night. Take your friends, order a big tub of popcorn and enjoy the "Tower Heist" ride.